One of the things I’ve been learning, and with which I’ve struggled for a long time, is the concept that Yoga and Yoga Asana means much more than the one or one-and-a-half hour classes I attend. Part of my struggle lies in the resistance to that idea. That is, of course, my competitive and ego driven part of me peeking through. But due to an overburdened schedule which makes getting into the studio that much more challenging, I’m finding that if I want Yoga Asana, then I’d better re-evaluate my ideas around it. And what I’ve begun to learn lately is that Yoga Asana can be found and done everywhere, even in the most unexpected places — and it can be FUN. I find myself seeking Tadasana while cleaning the dinner dishes. Or, if I’m reaching down into the cupboard, I open into a version of Warrior III. And sitting in my office chair provides ample opportunity for seated twists. And when I add in conscious breath, I’M DOING YOGA. I’m not in fancy yoga clothes. I’m not in a studio. I’m not even on my mat. But I’m doing yoga. "Legs Up a Very Big Rock" on Mt. Monadnock's summit. And, of course, Yoga is especially helpful before, during and after a hike. This past weekend, we hiked local (sorta) on Mt. Monadnock. I’ve hiked this mountain numerous times over the years and have found a special nook at the summit in which I love to repose. After eating, talking and laughing, I found myself wanting to be upside down. And since shoulderstand and/or headstand would NOT be safe where we were, I opted for Viparita Karani, or Legs Up a Wall, or in my case, Legs Up a Very Big Rock. I settled into Viparita Karani, enjoying the fresh air gently blowing over me, the scent of the crushed grass underneath me, and the relaxing bliss that this Asana often delivers. When I was ready to exit the pose, I opened my eyes and saw my partner stretching, preparing to get moving again. 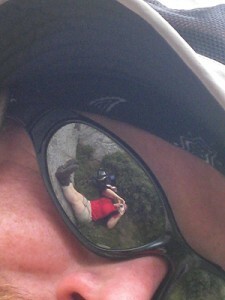 He stopped, looked down at me, and I realized that I could see myself in the pose through his very reflective sunglasses. It tickled me to no end, so I grabbed my camera. I was so content in that moment — humor, relaxation, nature and Asana all conspired to bring a very happy moment. So I wish you all find your Yoga wherever you go. When we’re open to our present moments, unexpected gifts may find a way in. Where off your mat do you practice? What unexpected places or circumstances offered up a Yoga moment? This was really great, Deb. I, too, have been using my practice for a long time doing seated twists at my desk throughout the day, boat pose on the couch, as well as extended forward folds when I pick something up from the floor. If I can’t sleep at night, I get up and do three rousing sun salutations – taking and releasing four deep breaths in downward facing dog each time – and believe me, I fall asleep within moments after that (I’m convinced it’s all about the breathing, which releases the stress that kept me awake). Anyway, your post was truly clever, and the image said it all. Let’s have some more of those!